I’ve been on a journey of subtlety making. This is a rendition of the Castle Subtlety in Pleyn Delit which in turn is based on the Forme of Curye’s recipe to make a castle. Take and make a foyle of gode past with a roller of a foot brode. & lyngur by cumpas. make iiii Coffyns of þe self past uppon þe rolleres þe gretnesse of þe smale of þyn Arme. of vi ynche depnesse. make þe gretust in þe myddell. fasten þe foile in þe mouth upwarde. & fasten þee oþere foure in euery syde. kerue out keyntlich kyrnels above in þe manere of bataiwyng and drye hem harde in an Ovene. oþer in þe Sunne. In þe myddel Coffyn do a fars of Pork with gode Pork & ayrenn rawe wiþ salt. & colour it wiþ safroun and do in anoþer Creme of Almandes. and helde it in anoþer creme of Cowe mylke with ayrenn. colour it with saundres. anoþur manur. Fars of Fygur. of raysouns. of Apples. of Peeres. & holde it in broun. anoþer manere. do fars as to frytours blanched. and colour it with grene. put þis to þe ovene & bake it wel. & serue it forth with ew ardaunt. Take and make a foyle of good pastry [foyles as in paper, i.e. sheets of pastry as thin as paper] with a roll a foot long and longer in proportion. Make four coffins [pastry cases] from the same pastry, with the roll the width of the small of your arm, and six inches deep. Make the biggest one in the middle. Fasten the pastry sheets at the mouth upwards. And fasten your other four [sic] on every side. Quaintly carve out keyntlich [battlements] above in the manner of embattling, and dry them until they’re hard in an oven or in the sun. In the middle coffin, do a mixture of pork with good pork and raw egg with salt. And colour it with saffron and do another crème of almonds, and put in the other cream of cow’s milk with egg. Colour it with sandlewood. Another manner – meat of figs, raisons, apples and pears and make it brown. Another manner – do the meat as you would for blanched fritters and colour it with green. Put this into the oven and bake it well. And serve it with hot water. It became a slightly more cheesy lard pastry. Recipe doesn’t say anything about putting it in the fridge so let’s carry on, although I did put it aside while I prepared the foundations of the castle towers. I used an old roll which fabric had come home on. (I….have a lot of these…. but the recipe also says that al. foil rolls or wrapping paper rolls would also work.) I cut four sections and the rolls ended up being about 15cm high and about a 5cm diameter. I wrapped the rolls in al. foil and then greased the foil with butter. Next time I will use more butter. Then I wrapped the pastry around the rolls and tried to make them roughly even.I ended up making them a bit base heavy and they didn’t need to be in the end. The pastry got pricked with a fork because it does rise a little bit. This is the first lot. I ended up making the walls later with a second batch of pastry. Walls. You can also see on the top left one that I haven’t pricked it with the fork enough so it’s formed a bubble. Baked until brown, about 20 minutes. Original walls were too small, they got super brown. The recipe tastes kind of like cheese biscuits. So that was cool. Anyway, eventually walls and towers were ready. I found that when it came to unstick the towers, it was easiest to pull the rolls out without the al. foil and the remove the al. foil separately. Would have been easier to remove in one lot if they had been the thinner rolls found in wrapping paper etc. Or if I’d used more butter in the greasing. Before towers were squared off with knife. I don’t actually think they did slump that much when baking, I think this is just me. Fiddling with how the walls and towers should be positioned. 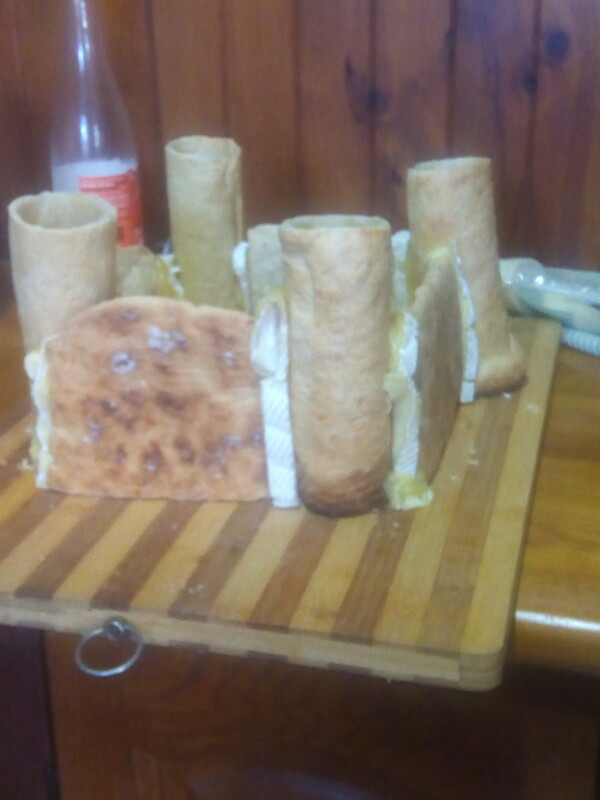 I cut slices of a cheap brie cheese off, so that it was thin slices of rind with brie, microwaved them for ten second and used the melty goodness as a mortar to stick the walls and towers together. I could have done a better job here. The towers were uneven so there was some guess work in making them more stable and finding the best place to put the walls so that they were together as much as possible. It was actually pretty easy to use the cheese as a mortar and it held together pretty well. The main issue was that the towers and wall edges, despite surgery with bread knife, were not perfectly in alignment with each other, which I think is something I could get better at with practice. I would also make the towers stick out more next time but I was worried about the positioning of the towers and the walls and their relative straightness. But, it still looks a look like Welsh Castles so…. I also deconstructed the tower, wrapped it up put it in the fridge and then reconstructed with fresh brie cheese two days later and it held up to that really well. Walls and tower were softer than they were when freshly baked but still very edible. It goes extremely well with the cheese, and I think that for a feast I would bring it out at the start, with additional bread, cheese, pickles and other antipasto type feast starters and let it be broken down and eaten with the cheese.